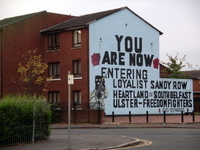 The movie is a docu-drama about a massacre of unarmed civilian demonstrators in the Catholic Bogside district of Derry, Northern Ireland, in 1972. And, according to the review, "the event has been blamed for turning peaceful dissent into two decades of civil war, and inspiring thousands of young men to join the IRA." After reading recently about the movie--and this is where the travel part comes in--I realized I don't know as much about this event as I'd like. Because I visited Northern Ireland in 2007, including Derry, I now find myself wanting to become more educated about how some of the worst strife started. Even more than a year later. This is what travel does. It opens your eyes to things you might not have paid close attention to before. The same thing happened during my college days. After spending my junior year in England, and traveling around Europe between terms, I became enamored of Italian art. When I returned my senior year, I took an entire year of art survey courses, excited to learn more about what I'd seen abroad. Often I was able to envision where that art was made, or is now hung, in European museums. And that made those courses three-dimensional and pulled me in more than they might have otherwise. Some people have always loved reading about history and culture. I guess I'm one of those people who needs to "touch." Once I visit a country, I'm forever interested in learning more about it. From the news. From books. From movies. That added depth of experience about history and the world is what keeps me traveling. Whether someone's willing to join me on any given trip, or not. Oh, and um, happy St. Patty's Day. "My father was a big whiskey drinker. He said that when he died, he wanted to be cremated. It took them three days to put the fire out." Joke, courtesy of Hugh, my bus driver during a tour of Northern Ireland. When someone ran out in front of our moving bus to cross a Belfast street, he said, "I guess that fella's tired of living." I craved a seat next to Hugh on that trip. He was alternatively funny and hugely informative. The major problem was understanding what he was actually saying. His Irish English was so strong, we sometimes had to get him to spell things so we'd know what he was saying. See that tar? That what? That tar. What's a tar? Not tar, tar. Spell it. T-O-W-E-R. Oohhh. Tower!! I wouldn't have experienced Hugh without signing up for a group trip and going on my own. If I'd traveled through Northern Ireland with friends, I would have heard a lot of American conversation, including my own. Who needs to travel for that? Ever sit in a "snug?" In the Crown Bar, a former gin joint also known as the Crown Liquor Saloon, the snugs are private, carved wood booths. Wait staff can pass drinks over the top of the cubicle-like snugs, or open the door and hand them in. 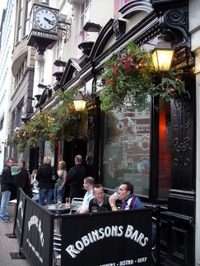 The Crown Bar is in the heart of Belfast. But isn't Belfast dangerous, you ask? Not any more so than other urban area. Peace broke out in Northern Ireland, as of the signing in the 90's of an agreement between the Catholics and the Protestants. 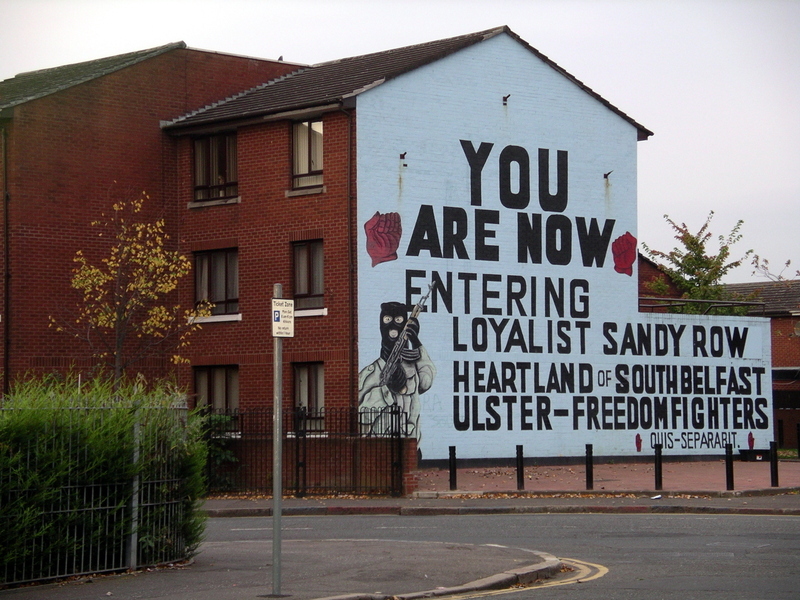 "The Troubles" are no more, although you can see much of the history of them via huge murals on walls and houses around the city. And people still hold grudges and have prejudices, like human beings everywhere. But tourism is coming back. The Crown Bar, near the Grand Opera House, was hopping on the Saturday night I wandered in. What a fine, historic interior. Etched and painted glass. Brocade walls. Red granite topped bar. And a lively crowd, packed in all possible spaces. I was in Northern Ireland with a tour group but I had time to wander off on my own each day. Including after dinner, which is when I explored the Crown. Another afternoon in Belfast I found "Joy's Entry" and several other narrow, maze-like pedestrian passages between buildings. You enter these walks and find "secret" pubs and restaurants like McCrackens or O'Neill's. A sign on a brick wall near one of the entries says they are "the close-knit passageways where Belfast was born and bred." I can imagine a great movie scene where people being chased slip into one of these entries and lose the car that was after them. I also took a "black taxi tour" and learned a lot about the history of The Troubles. My guide, Ken Harper, explained the symbolism on some of the murals. For instance, an "H" is for H block in a Northern Irish prison where Bobby Sands, an Irish Republican prisoner went on a hunger strike and died.